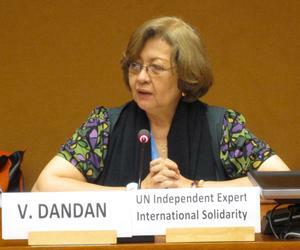 Virginia Dandan, an independent expert on Human Rights and International Solidarity of the United Nations (UN), will make an official visit to Cuba today, in response to an invitation from the island government, according to the Ministry of Foreign Affairs. During her stay in Cuba, the UN representative will carry out a program of meetings and other activities that will allow her to confirm the broad and sustained work of the Caribbean country in the area of ​​solidarity and international cooperation as a contribution to the promotion and protection of collective human rights at a global scale, the announcement reads. Precisely this Tuesday, the distinguished visitor plans to meet with members of Cuban civil society, which includes social and mass organizations, and leaders of the Ministry of Higher Education and the National Institute of Sports, Physical Education and Recreation. The UN expert will remain until Thursday in Havana, and on Wednesday she will be received by Foreign Affairs and Foreign Trade and Investment ministers, Bruno Rodriguez and Rodrigo Malmierca, respectively, among other officials. With a vast experience in teaching fine arts at the University of the Philippines, her country of birth, Dandan was a member and chair of the UN Committee on Economic, Social and Cultural Rights, an area where she is a recognized expert in international level. Last April Cuba received the United Nations Rapporteur on the Human Rights of Trafficking Victims, Maria Grazia Giammarinaro, which was the first visit to the island in 10 years by an independent expert of the Human Rights Council of that world body. "I have witnessed the political will of the Cuban State to combat trafficking in persons; there is a strong focus on prevention that I congratulate. I observed good practices and the authorities' interest in strengthening them, “she told reporters at the time. "In Cuba, people have a high level of education, know their rights, have a health system that assists, with highly qualified professionals, anyone who has an illness, which reduces vulnerabilities to this crime, which no country is immune to, "said Giammarinaro.